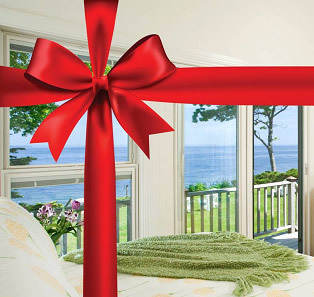 Named Top 10 B&B in the US and voted Best Water View, the Topside Inn offers guests a true Maine vacation experience. The 19th-century sea captain's home and summer guesthouses are located on three plus acres of private property with gardens and incredible harbor and ocean views from the highest point in Boothbay Harbor, Maine. Enjoy the convenience of walking to restaurants, shops and galleries in our waterfront coastal village. Overlooking beautiful Boothbay Harbor on Maine’s midcoast, Topside Inn affords guests amazing water views in every direction. Indulge in peaceful, comfortable rooms with modern amenities, and savor a delicious full breakfast to start each daily adventure. Take a quick walk down hill into the center of town to enjoy a boat tour, art galleries and shops, and a great seaside meal. Or head out by car to the nearby botanical gardens, hiking trails, lighthouses, golf course, and scenic country and ocean view drives. Let us help you plan a perfectly classic coastal vacation.